The difference between chronic and imminent suicide risk has only recently been articulated in the literature. Clinical instruments valuable in predicting suicide over a 10-year period were not effective in predicting completed suicides or even suicide attempts within a 6-month period. This discrepancy underscores the need for accurate assessment of acute or imminent suicide risk. Is this a patient known to be generally at high lifetime risk for suicide (such as a bipolar patient with severe agitated depressive episodes and a history of suicidal ideation, preparations, or attempts6)? Is this a patient who thinks of suicide as a potentially reasonable solution to a problem? Is this a patient who is currently in an acute state that might trigger suicidal action? Is there an emotional process emerging between the patient and clinician that might be a response to the patient’s suicidal intent, explicit or otherwise? Dimensional assessment of imminent suicide risk. The first dimension has been explored extensively and is already integrated into clinical practice. This article focuses on the next three dimensions. Knowing how to ask a key question or questions that would elicit imminent suicidal intent is of vital importance and has the potential to save numerous lives. To have a wide-reaching impact on clinical work, these questions must be easily administered by clinicians of diverse cultures and levels of training. They must be short, simple, and intuitive so that patients of diverse backgrounds and educational levels can easily understand them. Ideally, such questions should be clear enough to be asked by lay people, such as friends, relatives, and coworkers. 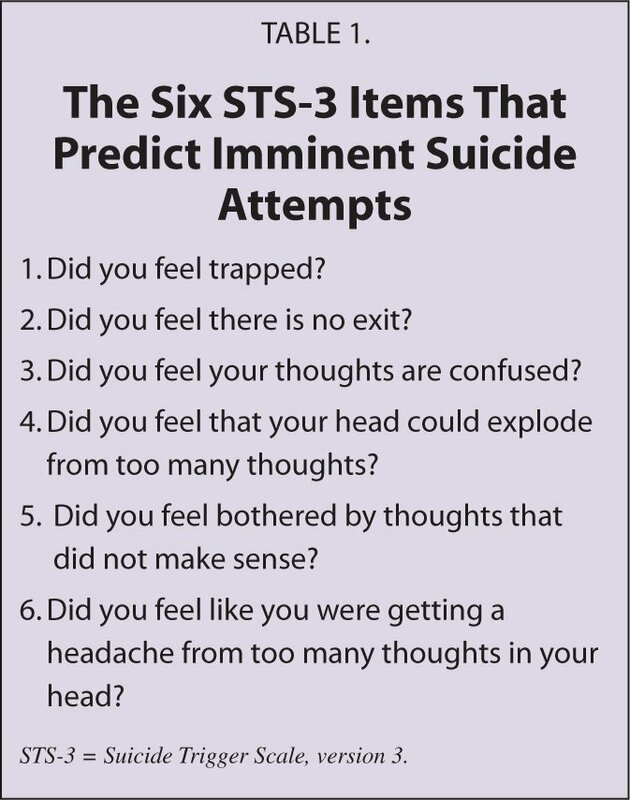 Although data on the use of the Suicidal Stroop Test and IAT are extremely encouraging,7,8 these neurocognitive tasks are fairly technical and time-consuming (20 minutes when taken by Igor Galynker, MD, PhD), and thus are much less likely to be used by front-line clinicians than a brief questionnaire. Consequently, in our preliminary work we examined if the Suicide Opinion Questionnaire (SOQ), which probes general social attitudes toward suicide and has been shown to differentiate respondents with and without a history of SA, could discriminate between present or future attempters and non-attempters. Thus in our study of acute suicidal states as a predictor of imminent post-discharge SA in high-risk psychiatric inpatients,9 we also administered the SOQ to a subgroup of 91 patients. We performed a series of linear discriminant function analyses to identify items discriminating between individuals who did and did not attempt suicide at hospital intake, in the 8-week period following hospital discharge, and at either time point. This generated the SOQ short form (SOQ-SF) list of eight items. These items appear to reflect two underlying factors: 1) acceptability of suicide, and 2) religious/moral prohibition. Participants who attempted suicide within 2 months of discharge tended to endorse statements describing suicide as acceptable and even normal, while disagreeing with statements that implied religious and/or moral prohibition of suicide. The items that probe these factors are 1) suicide is normal behavior, 2) sometimes suicide is the only escape from life’s problems, and 3) in general, suicide is an evil act not to be condoned. If the patient agrees with one of the first two statements and/or disagrees with the third, this is an indication that he or she may be at higher risk for imminent suicide. Clinicians should consider adding these items to their normal assessment for suicide risk. Although more work needs to be done before any instrument for assessing and stratifying imminent suicide risk is perfected, even now questions probing ruminative flooding and frantic hopelessness could help clinicians identify patients at the highest risk. The evidence that a patient’s transition from suicidal ideation (SI) to SA may be marked by a distinct pre-suicidal state10–14 is central to the idea of a “trigger state” that mediates the transition to suicidal action. Results by Fawcett14 indicate that suicidal individuals often experience increased anxiety and agitation, a combination of symptoms that he has termed “psychic pain,” before a serious suicide attempt. Furthermore, other studies10,15–17 report an acute, high-intensity, negative affect state that seems to serve as a trigger for SA. In agreement with this hypothesis, other reports have linked increased risk for suicide with affectively intense panic attacks,18–20 and our recent national database studies21,22 suggest that panic attacks may serve as a mediator for transition from SI to SA in depressed patients. Imagine: you have been left behind in a department store after hours. The lights are going out. You are trying to escape, you are running from door to door, but all the doors are locked. Although asking several similar questions about the same state of mind may seem redundant, in our analysis, each of the six questions above added predictive value for future SAs, suggesting that probing the suicidal state of mind from several different angles improves one’s ability to elicit suicidal intent. This course would be taken when time is not a constraint. When time is an issue, as is often the case in a psychiatric emergency department or even in an outpatient clinic, the six questions could be boiled down to these essential two: 1) Do you feel trapped with no good options left? 2)Are you overwhelmed, or have you lost control by negative thoughts filling your head? If the answer to both of these questions is an emphatic “yes,” then the person is in a state of ruminative flooding and frantic hopelessness and may be at risk for imminent suicide, particularly in the absence of strong protective factors. Surprisingly, our inpatient research data also suggest that those who answer an emphatic “no” are at a heightened risk for post-discharge suicide. Consequently, people who neither agree nor disagree strongly with these two questions are probably at lower risk. Although these findings need to be replicated in an office setting, it is very unlikely that the experience of an acute suicidal state differs between settings. Ruminative flooding and frantic hopelessness together comprise a novel syndrome, provisionally named the Suicide Trigger State.11 The affect associated with this state is that of restlessness, tension, and franticness, as if the patient were experiencing a sustained panic attack. Such intense distress and anxiety is often contagious and makes the clinician feel anxious and tense to the extent that he or she may be uncomfortable being in the same room with the patient and may feel an urge to stop the session. This emotional response experienced by clinicians (loosely termed “counter-transference”)28 could also be of help in identifying patients at risk for imminent suicide. This may be unexpected because our rational clinical judgment has been shown to be a poor predictor of suicide risk.29 However, the suicidal patient elicits powerful responses that may not become conscious; in their seminal 1974 article, Maltsberger and Buie30 describe emotional experiences and behaviors rooted in hostile countertransference to the suicidal patient. This is supported by data from neuroimaging studies, which reveal activation of brain regions primarily involved in unconscious processing during emotional as compared to cognitive empathy tasks.31 With this in mind, we retrospectively examined clinicians’ responses to their patients in the last session prior to the patient’s SA or death, using the Therapist Response/Countertransference Questionnaire (CQ),32 which we administered anonymously via an Internet survey service. We have identified a five-item subscale (the CQ-SF) describing a paradoxical combination of hopefulness and distress/avoidance that discriminated between suicidal patients and those who died unexpected non-suicidal deaths with 73% sensitivity and 73% specificity. The CQ-SF hopefulness and distress avoidance questions are listed in Table 2. Positive feelings toward any patients, suicidal or not, as well as hopefulness for their recovery, are very common in treatment and may not on their own be indicative of patients’ suicidality. On the other hand, feelings of dread and hopelessness strong enough to encroach on professionalism, both in returning patients’ phone calls and in discussing the confidential treatment with one’s spouse or significant other, are rare and could be identified as a marker of the patient’s intensifying suicidal state. 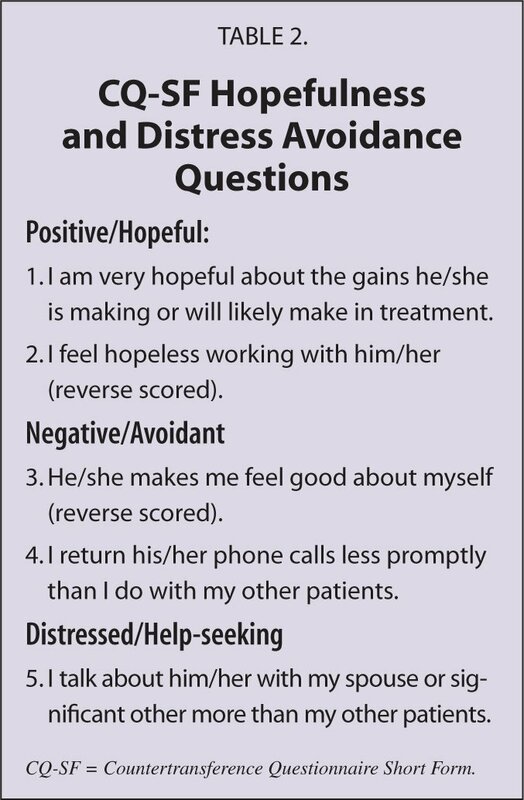 The last question in the CQ-SF, “I talk about him/her with my spouse or significant other more than my other patients,” pertains to the unease the clinician may feel treating the suicidal patient, which may be strong enough to cause them to look for advice from others on how to improve the failing treatment. To summarize, when treating a high-risk suicidal outpatient, or when making a decision about discharge and follow-up treatment plan of a high-risk inpatient recently admitted for SA, clinicians should assess if their patients perceive suicide as a potentially acceptable, legitimate option, if they feel trapped with no good options left, and whether they have lost control over these thoughts. If the answer to these questions is “yes,” and the clinician’s countertransferential response to those patients is that of dread, helplessness, and avoidance, potentially combined with a paradoxical hopefulness for improvement, these patients are likely at risk for imminent suicide. Ms. A was a 53-year-old woman with bipolar disorder who died of suicide by asphyxiation during her last admission to an inpatient psychiatric unit. She immigrated to the United States from Uruguay at age 23 with her first husband and was diagnosed with bipolar disorder when she was hospitalized at 25 after becoming manic and agitated at work. She was treated successfully with lithium carbonate but discontinued it 6 months after discharge. She had her second manic episode at age 27 when she discovered that her husband was having an affair and was hospitalized again. Lithium treatment was restarted and Ms. A was discharged in her husband’s care. This time she remained complaint with her medication and filed for divorce. She divorced her husband at age 29 and then married her second husband, Mr. A. Ms. A told him she had bipolar disorder and was on medication but her second husband never saw her manic until her third episode at age 35, when she stopped lithium in anticipation of pregnancy. Her pregnancy attempts were unsuccessful and Ms. A resumed lithium treatment, but she had three more manic episodes at ages 42, 47, and 50 while taking the drug. Her husband was supportive to her throughout her illness and used to say that 1 month of being sick did not offset 11 months of “blissful happiness.” At age 51, Ms. A started developing kidney failure and her creatinine climbed to 1.9 mg/dL. A urologist saw the patient and recommended stopping lithium as it was nephrotoxic. Lithium was discontinued and Ms. A given sodium valproate that gave her periorbital edema in the second week of treatment. Sodium valproate was stopped and Ms. A was given lamotrigine. After 3 months on 200 mg/day of lamotrigine, Ms. A started becoming depressed. Her lamotrigine dose was increased to 400 mg with poor response; her depression worsened and she became delusional and suicidal. She felt that her husband and the hospital staff were colluding to keep her sick and to transfer her to a state hospital where she would die. Her depression proved treatment resistant; she was treated with fluoxetine, sertraline, nefazodone, buproprion, citalopram, venlafaxine, phenelzine, and nortriptyline with no response. She continued to express suicidal thoughts and remained on one-to-one supervision. Finally, after 6 months of inpatient hospitalization she began to improve while taking 12 mg/day of selegiline. Her improvement was short lived, and after 3 months her mood plunged again. She started feeling that something had broken inside her, that she would never be her usual self again, and that she would become a burden to her husband who would have to place her in a state hospital where she would die. She expressed suicidal ideation and intent several times and rehearsed her suicide attempt on a few occasions by going to the George Washington Bridge and staring down, which she reported to her psychiatrist. She “committed to safety,” however, and continued her medications. She was then admitted again to an inpatient unit where she was given electroconvulsive therapy. This resulted in a mixed state with severe depression, agitation, thought disorder, and hypersexuality. At one of the current events groups, during a discussion of the recent suicide of a celebrity, she expressed her opinion that it was a person’s civil right to take their own life. Ms. A’s psychiatrist was running out of options and felt that the only choice was to keep her in the hospital for her protection. She felt relieved that Ms. A was being watched, but dreaded making her daily visits because Ms. A would tell her she still felt suicidal. She continued to be depressed and kept pacing the floor and saying that everybody was tired of her and that she knew she would be sent to a state hospital. She was repeatedly reassured by the team that no such plans were in the works, but she continued to ask for frequent reassurance from the nurses, patient care associates, and other staff members. Although Ms. A was not religious the team made the decision to address her spiritual needs and requested that a chaplain visit. Ms. A talked to the chaplain for 30 minutes but refused to see him again. The team’s consensus was that the patient was exceedingly difficult and should indeed be transferred to a state hospital. Ms. A’s psychiatrist felt increasingly frustrated, angry, and hopeless. She felt that all possible medications approved for the treatment of depression had been tried. As a last resort she tried an experimental intravenous ketamine infusion without any response. She then spoke to the patient about getting enrolled into a depression protocol at a neighboring academic hospital. This suggestion of transfer of care may have communicated both shared hopelessness and the rejection/abandonment on the part of the psychiatrist that Ms. A’s previous delusions clearly indicated she deeply feared. The day following this conversation, Ms. A seemed relieved and enthusiastic. She went to two occupational therapy groups in the morning and was brighter and more hopeful than usual. The unit staff felt a sense of relief, and when Ms. A went to her room after the group, she commented that she seemed hopeful about the new treatment option. Fifteen minutes later, Ms. A was found dead in her room. She had put her head inside a plastic bag left by one of her roommate’s visitors and died of asphyxiation. Ms. A’s case illustrates several key points about the suicide trigger state and clinicians’ countertransference to it. In addition to feeling depressed and hopeless, and expressing suicidal ideation, Ms. A felt trapped by her condition and believed that there were no good treatment options. She was ruminating over her fate and lost control over those thoughts (ruminative flooding). She was physically restless while repeatedly looking to staff for reassurance and never received a satisfactory response (frantic hopelessness). Finally, she accepted ending one’s life as a legitimate option and subscribed to no religious prohibitions against it. Moreover, both Ms. A’s psychiatrist and the unit staff developed increasingly profound negative countertransference to her; she made them feel that they were incompetent professionally and taken advantage of by her neediness, both on a professional and human level. The short-lived hopefulness prompted by the patient’s suddenly cheerful affect after she obtained the means for suicide and decided on a plan was a countertransferential alarm signal that was missed by the exhausted staff. Although Mrs. A explicitly denied suicidal ideations, questions probing the acuity of her Suicide Trigger State and implicit acceptance of suicide such as “Do you feel trapped with no good options left?”; “Can you stop these thoughts with the force of will or have you lost control?”; and “Do you believe that suicide could be a reasonable choice for some people?” might have alerted the clinicians to her state of frantic hopelessness and ruminative flooding, and the absence of moral barriers against taking her own life. A focused and honest examination of their own feelings toward Mrs. A could have alerted clinicians to the escalation of “countertransference hate” and paradoxical unfounded hopefulness. The three questions above and the assessment of the clinicians’ own states of mind would not have taken more than 3 minutes. When assessing patients’ suicidality, clinicians need to distinguish between chronic suicide risk and risk for imminent suicide attempt. Although there exist a number of validated instruments relying on explicit questions about clinical history, suicide ideation, and intent, at present we lack validated tools to assess imminent risk. Still, recent research has identified an intense pre-suicidal state of psychic pain, frantic hopelessness, and ruminative flooding that could be probed with simple questions that do not explicitly ask about suicide and are less dependent on patients’ truthfulness about their intent. Clinicians’ emotional responses to the pre-suicidal state of mind could be powerful tools in assessing imminent suicide risk. Clinicians need to be trained in identifying their feelings, and future research should focus on this topic. A patient’s permissive attitudes toward suicide may also provide additional information regarding his/her risk. The development of a reliable and accurate method for predicting imminent suicide would solve one of the biggest problems mental health professionals face today. Such a scale could be used not only by clinicians but by lay people, especially those who are closest to at-risk patients. In the future, we would like to see all of these individuals trained to assess imminent suicide risk. In the meantime, it is our hope that these simple questions will be a small step toward solving this important issue. Nock MK, Deming CA, Fullerton CS, et al. Suicide among soldiers: a review of psychosocial risk and protective factors. Psychiatry. 2013;76(2):97–125. Matthews K, Milne S, Ashcroft GW. Role of doctors in the prevention of suicide: the final consultation. Br J Gen Pract. 1994;44(385):345–348. Fawcett J. Depressive disorders. In: Simon RI, Hales RE, eds. Textbook of Suicide Assessment and Management. New York, NY: American Psychiatric Publishing; 2006:1–24. Galynker I, Ieronimo C, Perez-Aquino A, Lee Y, Winston A. Panic attacks with psychotic features. J Clin Psychiatry. 1996;57:402–406. Yaseen ZS, Chartrand HS, Mojtabai R, Bolton JM, Galynker I. Fear of dying in panic attacks predicts suicide attempt in comorbid depressive illness: prospective evidence from the National Epidemiological Survey on Alcohol and Related Conditions. Depress Anxiety. 2013;30(10):930–939. Fawcett J, Scheftner WA, Fogg L, et al. Time-related predictors of suicide in major affective disorder. Am J Psychiatry. 1990;147(9):1189–1194. Did you feel there is no exit? Did you feel your thoughts are confused? Did you feel that your head could explode from too many thoughts? Did you feel bothered by thoughts that did not make sense? Did you feel like you were getting a headache from too many thoughts in your head? I am very hopeful about the gains he/she is making or will likely make in treatment. I feel hopeless working with him/her (reverse scored). He/she makes me feel good about myself (reverse scored). I return his/her phone calls less promptly than I do with my other patients. I talk about him/her with my spouse or significant other more than my other patients. Igor Galynker, MD, PhD, is Associate Chairman, Department of Psychiatry, Mount Sinai Beth Israel. Zimri Yaseen, MD, is Attending Psychiatrist, Mount Sinai Beth Israel. Jessica Briggs, BA, is Program Assistant, Department of Psychiatry, Mount Sinai Beth Israel. Address correspondence to: Igor Galynker, MD, PhD, Department of Psychiatry, Mount Sinai Beth Israel, 317 East 17th Street, New York, NY 10003; email: igalynke@chpnet.org.